Lyudmila Alexeyeva: "It's a good sign." 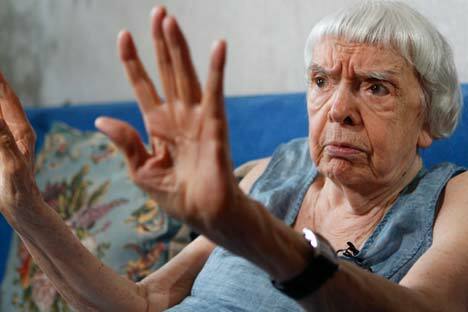 Lyudmila Alexeyeva, Russia's oldest human rights activist and head of the Moscow Helsinki Group, has backed the U.S. plans to close the Guantanamo prison. "That prison undermined the moral image of the U.S. as a democratic country and I am very happy that they are going to close the prison. It's a good sign," Alexeyeva told Interfax on Feb. 24. Alexeyeva said the Guantanamo prison is not the only thing human rights activists are complaining about in the U.S.
"The regime in U.S. prisons is, of course, much better than in Russian prisons. But U.S. prisons are very closed to public control. I could name other problems in the sphere of human rights in the U.S., but I won't, or it will be like we see a speck in our friend's eye, but don't see a log in our own. We, in Russia, have many more problems in the sphere of human rights," she said. Alexeyeva said that the U.S. is a country with high standards in the sphere of human rights protection. U.S. President Barack Obama said earlier that the Pentagon has submitted to the U.S. Congress a plan to close the Guantanamo prison. Obama said the Guantanamo prison does not strengthen the security of the U.S., but only undermines it. Of the 91 prisoners held in the prison, 34 may be transferred to third countries, and up to sixty may be sent to the U.S., the BBC has reported. Obama has promised more than once, to close the Guantanamo prison, since he took office, but was faced with resistance from Congressmen. The Guantanamo prison was created in 2002 at the U.S. military base in Cuba. Terrorism suspects are held there. Some 700 people have gone through the prison.